These properties allow you to layout elements relative to other elements on screen. The value for each of these elements is the id of the element you are using to layout the new element. Each element that is used in this way must have an ID defined using android:id=”@+id/XXXXX” where XXXXX is replaced with the desired id. You use “@id/XXXXX” to reference an element by its id. One thing to remember is that referencing an element before it has been declared will produce an error. 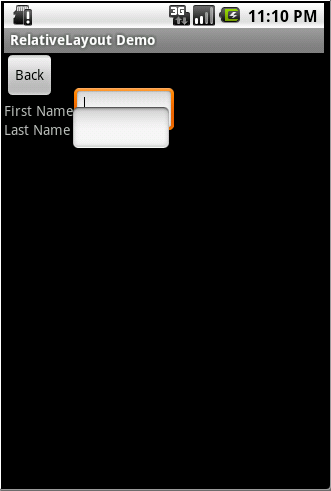 I wanted to show this to you because the first time I made a RelativeLayout I did exactly this and then looked at the screen and said, “Hang on a minute, that’s not what I wanted!” The problem here is that when Android draws the TextView lastName below the TextView firstName it only sets aside the space it needs for the TextView. Android only reads the Layout XML one time so it doesn’t know that an EditView is the next item and doesn’t plan for it. So when the EditView is drawn to the right of the TextView it only has the height of the TextView to work with so it overlaps the EditView above it. 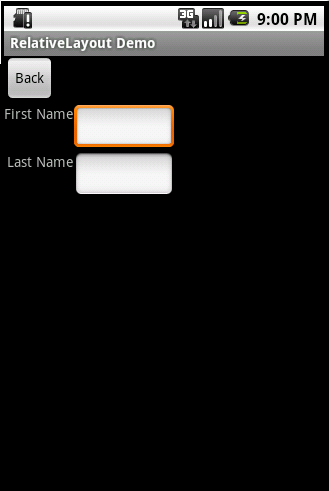 Here is the Layout XML I wrote to create the form the way it should look.